Discuss the ways in which house wraps contribute to moisture management and enhance green building goals. Compare various types of weather-resistant barriers in terms of their ability to effectively minimize moisture and air infiltration and allow drainage of water in the wall cavity. Identify the key considerations in the proper specification of a house wrap product to ensure occupant health and safety and consistency with sustainability objectives. Explain how to overcome potential problems in the installation process in order to maximize the effectiveness of the specified house wrap material. Moisture intrusion. It has bedeviled builders and homeowners for centuries. Moisture in the building envelope can cause problems for the structure and its occupants, including rot, mold, mildew, and microbial growth. Left untreated, unwanted moisture can jeopardize a building's integrity, leading to customer dissatisfaction, callbacks, and, in some cases, even structural failure, litigation, significant claims against builders, and expensive repairs and remediation. Compounding the problem is that even severe moisture damage can occur without telltale signs. In recognition of the potential pitfalls associated with moisture intrusion, building codes are becoming stricter with regard to moisture management, and building architects and owners more attuned to the often onerous implications of improper moisture control. Many in the building community rely on house wraps, or weather-resistant barriers (WRB) to prevent moisture entry into the wall cavity and to create continuous protection around the structure, covering gaps, cracks, and other holes between the sheathing and the cladding. Over the years, house wraps have evolved, with some of today's versions better able to also protect against air infiltration and easily drain any water that has penetrated the wall cavity, and allow water vapor to escape the home—all at an affordable price. This article will highlight the basic characteristics of house wraps, compare the various types of house wrap products on the market, and identify the features to consider in properly specifying a house wrap in a residential structure. While many builders and homeowners assume that the siding on a house is sufficient protection against water infiltration, this is not the case. Even perfectly installed, high-quality siding cannot perform that task, as water, particularly wind-driven rain, will inevitably find its way through gaps and cracks in the wall assembly. That goes for all claddings—reservoir claddings like stucco as well as wood, insulated vinyl, or fiber cement all have the potential to hold trapped moisture. Many in the building community rely on house wraps, or weather-resistant barriers (WRB), to prevent moisture entry into the wall cavity. Over the years, it has become common practice to install a weather-resistant barrier (WRB) between the sheathing and the cladding as a second line of defense in moisture protection. A WRB, or house wrap, is a lightweight synthetic material which, if properly designed and installed, will protect the structure from weather, moisture, and other environmental damage over time. Specifically, a house wrap has a threefold task: stop liquid water intrusion; be sufficiently vapor permeable to promote drying of the wall cavity while allowing water vapor to escape outside of the structure; and prevent air infiltration into the structure. In other words, an effective house wrap will assure that bulk water is not admitted to the wall cavity, and any water that does breach the barrier is quickly drained, allowing the wall system to dry out, and drafts are avoided—all of which work to favorably impact structural integrity, the service life of the building, indoor air quality, and energy costs. Permeability is a key consideration as, if water is left to collect within the walls, not only is the possibility of mold increased, but the built up moisture will almost certainly compromise the R-value of the insulation. To be considered effective, a house wrap product should possess a relatively high moisture vapor transmission rate. If they are properly sealed, house wraps can also serve as an effective air barrier. In fact, preventing air leakage can be a key part of a house wrap's contribution to sustainable building. The DOE, in fact, cites house wraps as the most common air barrier material, and notes that sealing the house wrap joints with the manufacturer's tape can boost the material's performance by some 20 percent.2 House wraps can also help the home to qualify for and maintain ENERGY STAR® certification. Most structures, regardless of whether they are stick built or metal framing, commercial or residential, single or multi-level, should use some type of weather-resistant barrier. 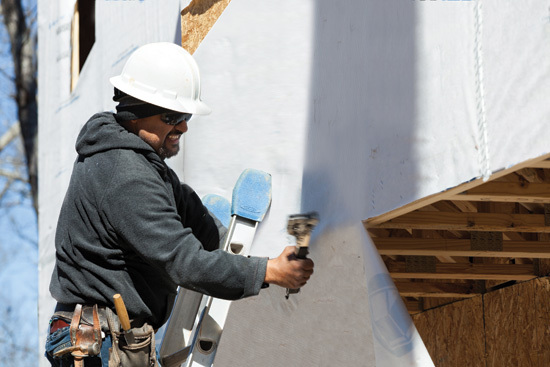 House wraps are necessary protection in all wood-framed residential structures and most are applicable in multifamily residential structures up to five stories high—beyond that height limit a commercial-grade wrap is needed as typical house wraps are subject to tearing from wind forces. The exterior of the structure should also be taken into consideration when selecting a house wrap. Reservoir claddings that absorb and store water such as stucco, brick, and stone all pose serious concerns in regard to water penetrating into a wall assembly—walls should be built with an air space behind these types of cladding.